These days, you can’t get away from references to Weimar era figures, in art, politics, or anywhere else. In that Weimar was a remarkably creative period, this is a good thing. In that the renewed attention to Weimar owes in large part to the all-too-evident parallels to today, however, this is not so great. When I was twenty, the thought of living in a collapsed state amid great art and sexual license and then being forced into exile seemed like a lot of fun. Now, the romance of forced exile has lost its appeal. 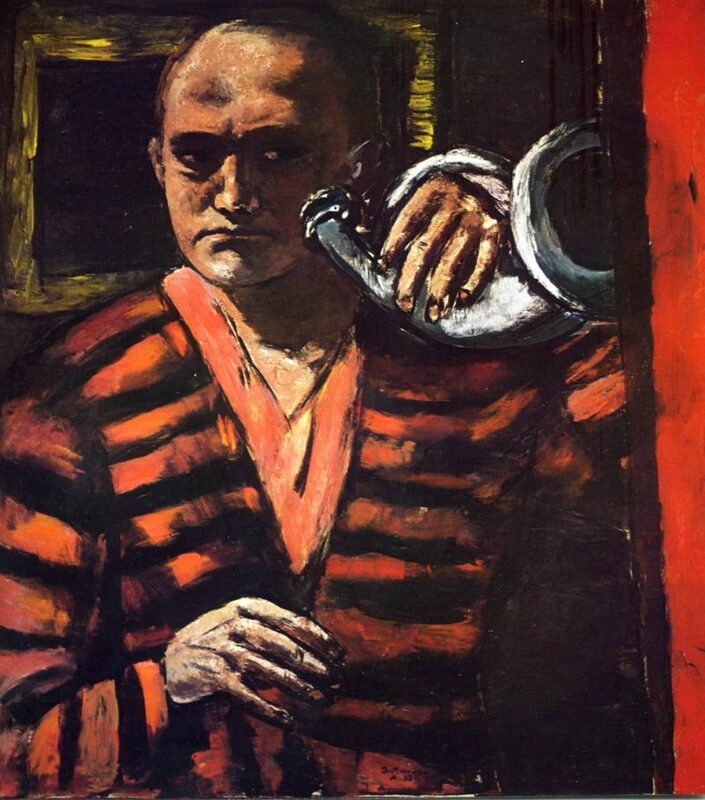 The first room of the exhibition is devoted to self-portraits: as the one of the exhibition’s captions notes, Beckmann was among his own favorite subjects. Beckmann was a great scowler, and here we see him scowling in various costumes, often smoking, and in one case holding a postal horn (Self-Portrait with Horn) (1938. 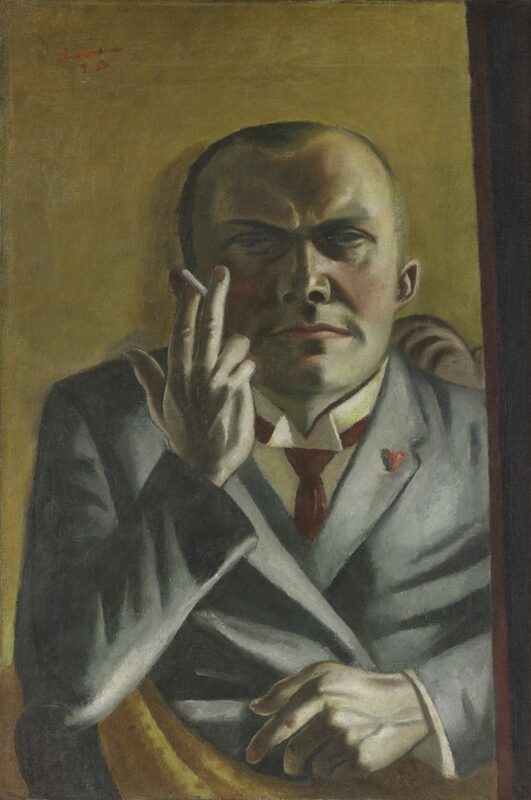 Beckmann always looks terribly sophisticated and deeply unimpressed, particularly when dressed in more formal clothing as in Self-Portrait with a Cigarette (1923). Beckmann also seems to be eternally 50, regardless of his chronological age. 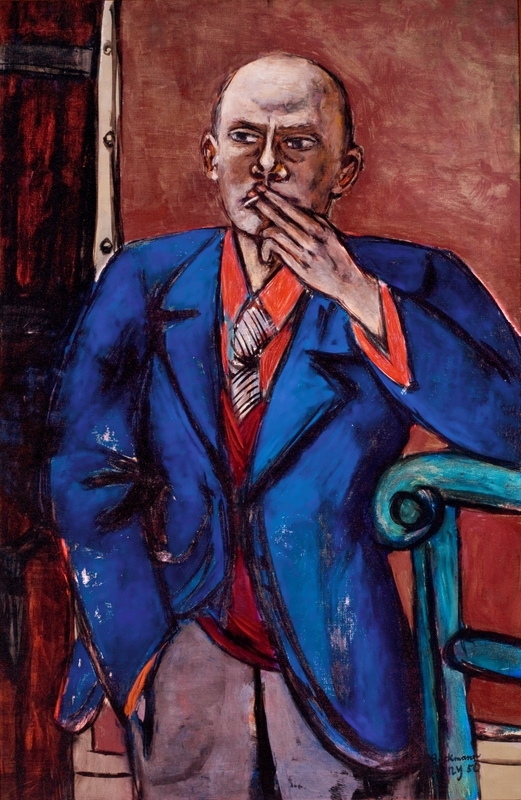 He appears beyond his years in 1923, but looks to have aged little in his last self-portrait, Self-Portrait in Blue Jacket (1950) (also a product of Beckmann’s short sojourn in New York). Moving on, we see some examples of why Weimar remains an example of aesthetic depth combined with unembarrassed hedonism. Family Picture (1920) depicts a family I never saw where I grew up. It reminds us that Germany before the Nazis had the reputation of being a randy place. The Bark (1926), depicts a scene from Beckmann’s honeymoon in Italy with his second wife, Quappi. We see at least three couples in a boat on a lake, limbs intertwined, and breasts bare, with no evident body shame. It gets darker. My parents had a book on German art (the title escapes me now), and contained in this book was, among other paintings, Beckmann’s triptych, Departure (1932, 1933-35). At once mesmerizing and deeply disturbing, yet beautiful, with the deep colors and contrasts that are characteristic of expressionism, it haunted me back then, and still does. 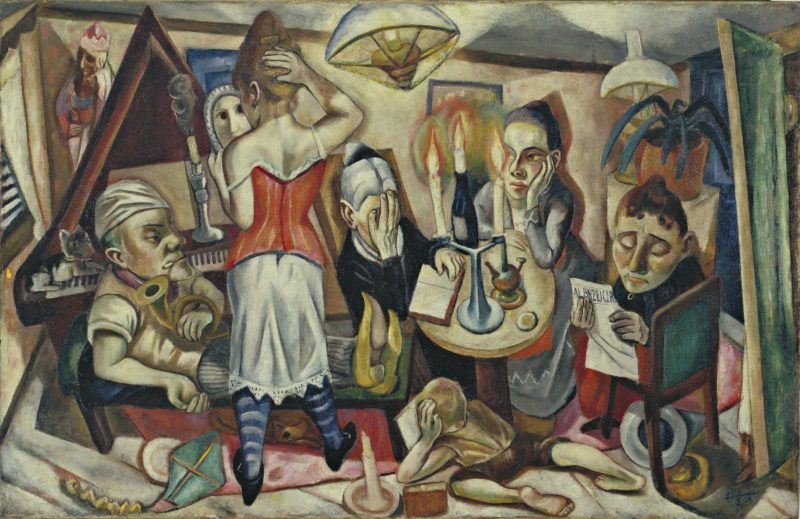 Painted at the beginning of the Nazi era, and while Beckmann still lived in Germany, it does not directly portray anything related to fascism or Nazi regalia. Instead, it mixes classical architecture with modern clothing, and, in the middle painting of the triptych, what appear to be Medieval warriors. In this way, Departure captures the backward-looking reactionary nature of fascism, and shows us what’s coming. Departure forces us to observe directly what depraved brutality really is. You can’t unsee this, and you can’t take your eyes away. In 1937, Beckmann left Germany for the Netherlands. Unlike a lot of Weimar figures, he wasn’t political enough for the Nazis to imprison him or drive him into exile. They just branded him a degenerate and removed his work from museums. Once relocated, he immediately applied for a visa to come to the United States. He had to wait until 1947 (another unpleasant parallel to today), sitting out the war years in Nazi-occupied Amsterdam. Landing at first in St. Louis and then arriving in New York in 1949, Beckmann enjoyed a burst of productivity, before dying of a heart attack, while on his way to the Met Museum to see his Self-Portrait in Blue Jacket, discussed above. 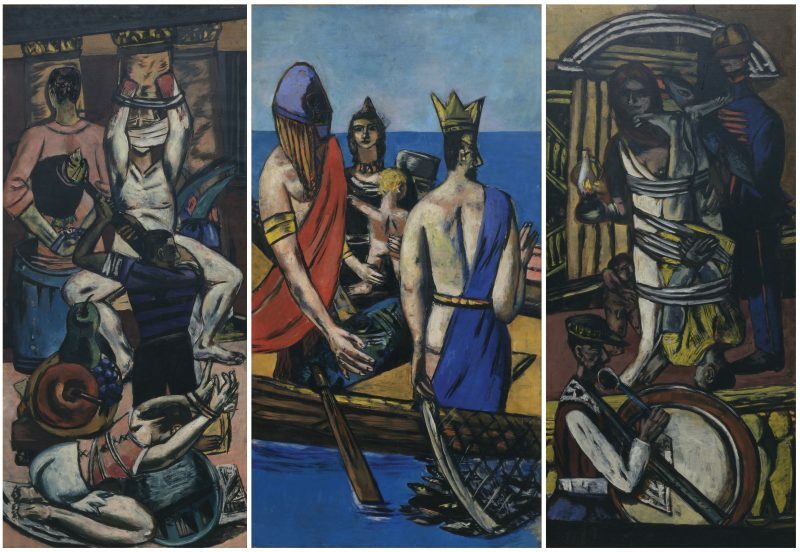 Beckmann’s American paintings don’t look like America. But that’s a good thing, I suppose. 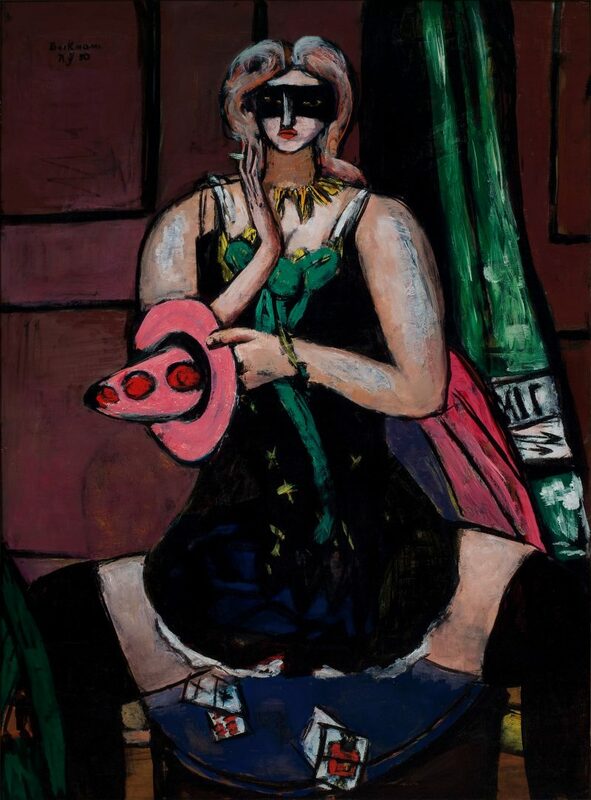 I’m glad that we let Beckmann into the US and allowed him to enrich us. Let’s hope that we continue allowing others to make us better.